The memo claims the FBI and the DOJ obtained and renewed a surveillance warrant on Carter Page using information from the "Steele dossier." The controversial GOP memo that has allegations against the FBI and Justice Department has been released. But what's in it? The four-page document claims the FBI and the DOJ obtained and renewed a surveillance warrant on former Trump campaign adviser Carter Page using information from the so-called Steele dossier. The Steele dossier detailed Donald Trump's alleged connections to Russia. Hillary Clinton's presidential campaign and the Democratic National Committee reportedly helped fund the opposition research, which a Republican opponent of Trump initially requested during the primaries. The memo accuses investigators of knowing the dossier was financed by the Clinton campaign and the DNC but also of failing to disclose the connection in requests for surveillance on Page. He said in a statement before it was released, "It's clear that top officials used unverified information in a court document to fuel a counter-intelligence investigation during an American political campaign." 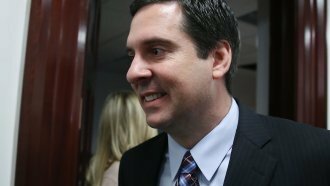 Still, the memo only contains information Republican staffers for the House intelligence committee collected. And critics have argued the document is incomplete and misleading. As the FBI said, "We have grave concerns about material omissions of fact that fundamentally impact the memo's accuracy." The memo does acknowledge the FBI launched its investigation three months before asking to monitor Page. It also mentions the FBI launched the investigation because of unrelated intelligence about another adviser, George Papadopoulos.